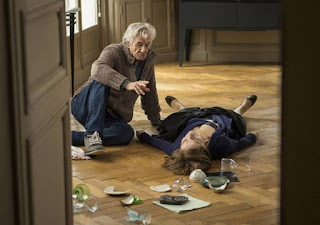 The announcement that Isabelle Huppert was to star in Paul Verhoeven's next film, Elle, caused ripples of excitement among cinephiles. What sounds like an unlikely pairing at first is not all that surprising, considering how brilliantly the French actress has managed her career recently. Far from being stuck in an ivory tower, she has been game enough to work with such directors as Brillante Mendoza and Hong Sang-soo. And given the subject matter, Elle is bound to cause the kind of controversy that the Dutch director is so fond of. And a trailer has unexpectedly landed this morning. For a film mainly set in somebody's house, the film has been long in the making. First announced two years ago, some were hoping for Cannes last year, then the autumn festival circuit, only for the director to announce that Elle would be ready in February this year. Absent from the Berlin line-up (but there is still time for the film to be a late addition), we should expect it either in Cannes or Venice this year. And it has at least a confirmed release date in France, the 21st of September. Which makes the landing of its trailer seem rather early. I had promised myself not to go the easy, click bait route of discussing trailers, trailers' teasers, posters, vague casting rumours etc... but I'll have to make an exception as this promises to be rather special. 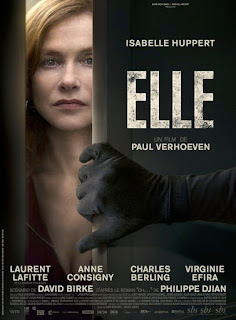 I am particularly intrigued by the rather stylised acting of Isabelle Huppert this, very unlike her, and which makes me thing we should expect a certain degree of satire and perhaps black humour, and not the straight-forward psycho sexual bourgeois drama the synopsis hints at. The trailer is in French, so I thought I would translate the dialogues, marking the time frame of each line. You've been raped? My god, what did the police say? You have not reported it? Nice outfit, you're going skiing? We should still be together, it's all your fault! It'd be a serious offence to do so! You couldn't care less what I thought of this, hey?